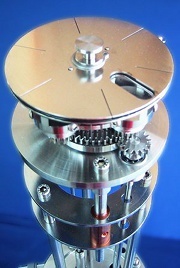 Target carousel allows movement of laser spot across the center of the rotating target disc. This flips the incidence angle of the laser beam relative to the target material, reliably avoiding cone formation! 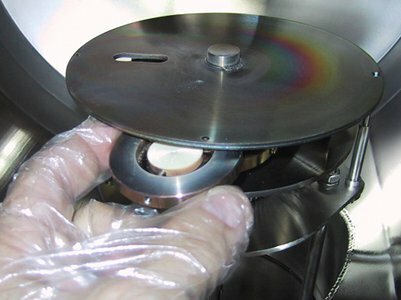 Cross-contamination shielding between targets: shielding plates between the targets and a heat shield/cover on top of the target carousel encapsulate the targets currently not in use. 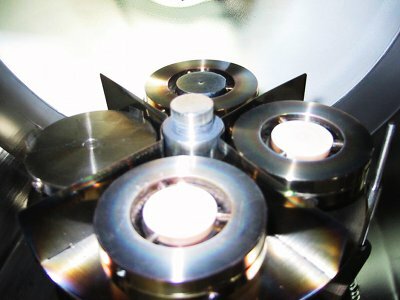 PLD target manipulators and target holders are one of the key features of all SURFACE PLD systems. For basic PLD systems without load-lock, a standard target manipulator holding four targets with up to 2" diameter and 6 mm thickness is available. 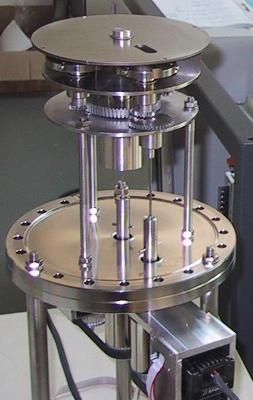 For UHV Laser MBE systems, SURFACE offers a target manipulator with a transferable target carousel, holding up to five 1" diameter targets, so it is not necessary to vent the deposition chamber to exchange or inspect targets. For native playback of the videos on this web page, the minimum web browser versions are: Firefox 3.5, Chrome 3.0, Safari 3.1, Opera 10.50, Internet Explorer 9.0, Konqueror 4.4. Another option is to install the Adobe Flash plug-in version 9 or higher. Self-aligning design: After carousel transfer, no alignment is necessary. By driving the substrate position drive, the carousel automatically locks into a defined position. This avoids target material mixups caused by forgotten position alignment. Toggling: The target is rotating and the target carousel moves back and forth in a continuous motion so that the laser beam hits the target at any radius from the target center. This mode is easy to set up, only the target diameter needs to be known. 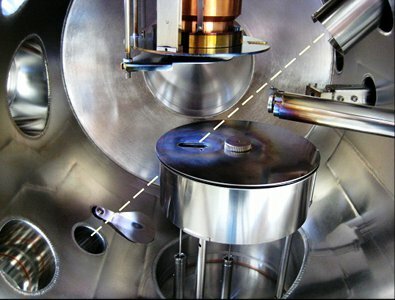 Scanning: The target carousel is moved so that the laser beam “writes” defined tracks on the target. Target rotation speed and track spacing are adjusted to match the laser spot size and repetition rate. This achieves a very even wear of the target surface. If for any reason the target does not wear evenly, or if the target should be used more at certain radii intentionally, the process can be further adjusted by a correction table that controls the ablation time on each track.